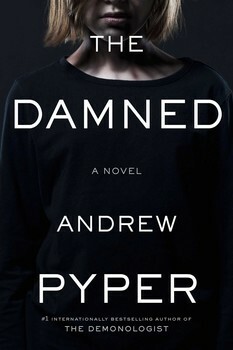 Andrew Pyper does it again with The Damned. Creepy, atmospheric and with more than a touch of existential tragedy, the book is signature Pyper. I raced through the book in a couple of days, and ended up not quite knowing how to feel at the end. “I have a talent for dying,” protagonist Danny Orchard admits. “It’s the one thing it seems I can do, not just once like everyone but over again.” Danny is a middle aged man who had narrowly escaped death at 16, in a fire that ended up killing his beautiful, psychotic twin sister Ashleigh. Now a bestselling author who’d penned an account of his experience in the “After” (Danny’s term for the afterlife), Danny has lived his entire life haunted by Ashleigh’s spirit, who appears determined to take Danny back into the After with her. Just like my favourite Pyper novel The Guardians, The Damned focuses on the intensely personal, small scale, individual type of horror. Danny’s attempts at a normal life, foiled by his sister’s spectre appearing at inopportune moments illustrate a very personal kind of hell on earth. Pyper includes other characters who are undergoing similar experiences with their own departed unloved, and these incidents are both chilling and tragic. On one hand, The Damned is a freaky horror story (a scene with a washing machine almost gave me nightmares); on the other hand, it’s also a potent metaphor for how we can never really escape the people who have touched our lives. An abusive father may die, but his daughters will never completely escape the effects of his abuse. Ghosts, whether corporeal or psychological, are real. Even Pyper’s version of the After is based on reality — a bit of earthly life stretched out to eternity. This grounds the unknown of death in something tangible, and makes the idea of hell even more within our grasp. What elevates this straightforward horror story into something much more troubling is that Pyper resists comfortable, easy characterizations. For example, it would be easy to paint Ashleigh as purely evil. Just like the abusive father who haunted another character, Ashleigh’s cruelty lives on and impacts upon Danny’s life for decades afterwards. However, Ashleigh’s explanation of her nature, rooted in a near death experience the twins had in their mother’s womb, raises questions about good and evil, and the justice of her damnation. Questions that go far beyond a novel, and possibly into our own concept of heaven and hell, right and wrong. The Damned is a fairly quick read, mostly because you just keep wanting to find out what happens next. But much like Pyper’s ghosts, the disquieting questions his novel raises linger on long after you turn the last page. This entry was posted in Book Reviews and tagged 50BookPledge2014, Fiction, Horror, Simon and Schuster by Jaclyn. Bookmark the permalink.